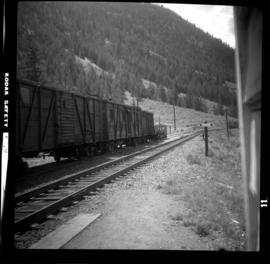 Photograph depicts a work train on a spur. Taken from the shelter of the depot in Pavilion. 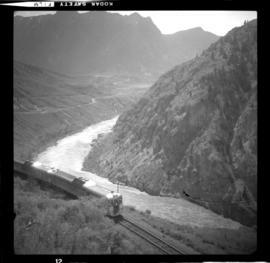 Photograph taken loooking southwards, down the Fraser Canyon, between Pavilion and Lillooet. 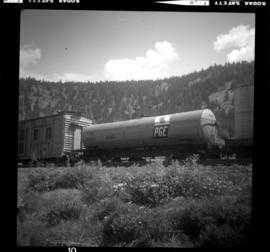 Visible is a northbound Budd car going slowly up a steep grade. Photograph taken on mile 178.0. Depicts a work train on a spur with a water tank car.